Preheat the oven to 50 °C. Using the KELOMAT MANUAL FOOD PROCESSOR, work the milk, flour, eggs, and one pinch of salt into a smooth batter. Using a silicon brush, thinly coat the base of the ELEGANCE PANCAKE PAN with oil. To make sure that the pancakes come out nice and thin, only pour a little batter into the pan. Distribute the batter equally throughout the pan by tilting the pan until it covers the base. Fry the pancakes until crispy and brown on both sides. Keep the pancakes warm by keeping them covered in the oven until all the batter has been used up. If the batter is too thick, mix in some sparkling mineral water. 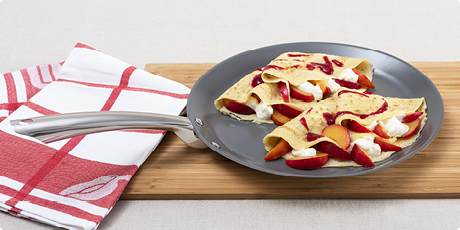 Fill the pancakes with the fried plums and vanilla curd crème, dust with icing sugar, and garnish with raspberry sauce. Allow the butter to melt in the mini pan. Briefly fry the plums in the butter, stirring continuously while doing so, then add brown sugar and cinnamon and fry briefly once more, still stirring continuously. Beat the curd, yoghurt, icing sugar, and vanilla sugar in a mixing bowl until smooth. Using the manual food processor, whip the cream until stiff, and mix it into the curd mixture. Using a hand-held mixer, finely puree raspberries, orange juice, and honey. 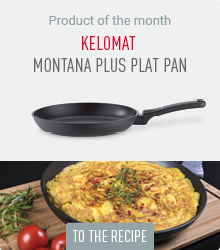 The ELEGANCE pancake pan from KELOMAT is a must for all those who love pancakes and crêpes. The pan has a diameter of 28 cm and a specially levelled low rim which makes flipping the pancakes in mid-air and taking them from the pan as easy as child’ play. 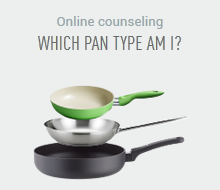 The pan has a ceramic non-stick sealing on the inside which prevents sticking. The ceramic sealing is robust. But handling in the pan with scratching or sharp objects should be avoided. It is best to use our plastic kitchen utensil. The extra strong thermos-stable bottom ensures a short browning time, uniform heat distribution and sustainable heat storage. The pan is ready for use on all types of stoves and can also be placed in the oven. 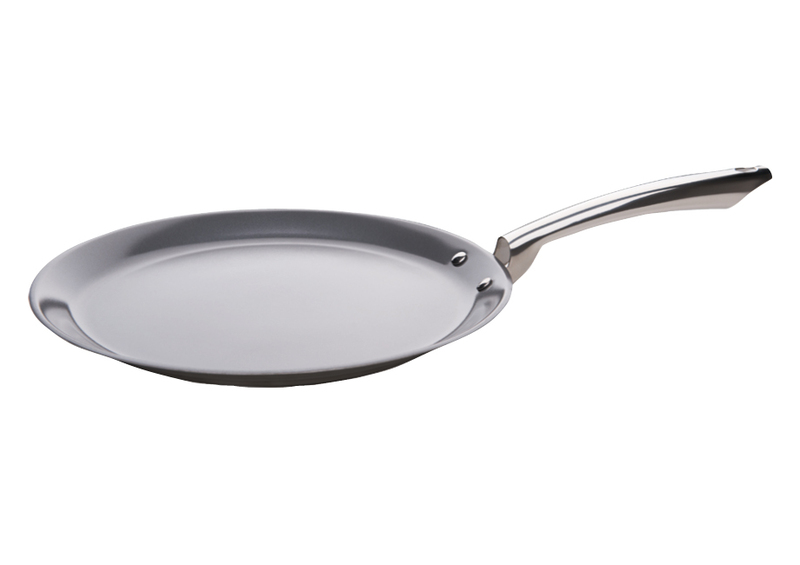 The strong stainless steel handle sits comfortable in your hand and makes flipping pancakes as easy as child’s play.